محمدی منفرد, بهروز. (1395). نقدی بر زمینه‌‌‌‌گرائی ساختاری توجیه باور اخلاقی. اخلاق وحیانی, 6(1), 129-155. بهروز محمدی منفرد. "نقدی بر زمینه‌‌‌‌گرائی ساختاری توجیه باور اخلاقی". اخلاق وحیانی, 6, 1, 1395, 129-155. محمدی منفرد, بهروز. (1395). 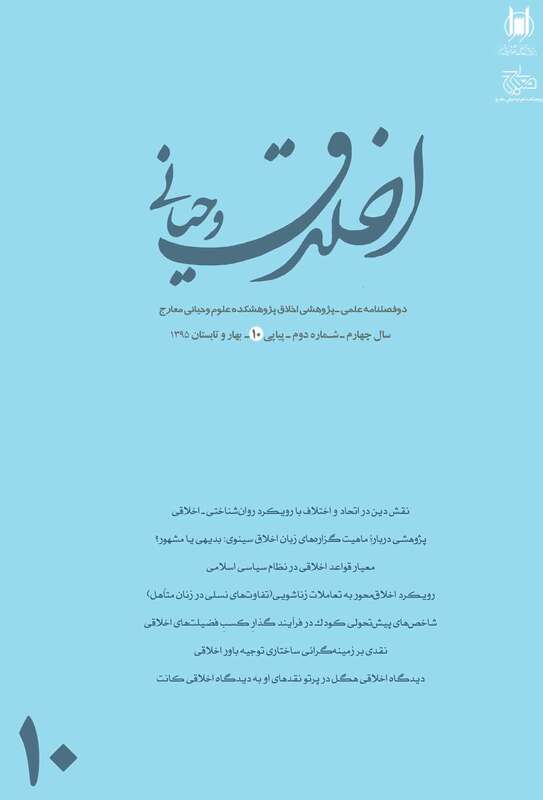 'نقدی بر زمینه‌‌‌‌گرائی ساختاری توجیه باور اخلاقی', اخلاق وحیانی, 6(1), pp. 129-155. محمدی منفرد, بهروز. نقدی بر زمینه‌‌‌‌گرائی ساختاری توجیه باور اخلاقی. اخلاق وحیانی, 1395; 6(1): 129-155. مبناگرایی و انسجام‌گرایی اخلاقی رویکردهایی سنتی برای ساختار توجیه باور اخلاقی‌اند که هریک مشکلاتی دارند؛ ازاین‌رو، امروزه برخی فیلسوفان اخلاق مانند مارک تیمونز، زمینه‌گرایی ساختاری توجیه باور اخلاقی را نظریۀ مستقلی در عرض آن دیدگاه‌ها می‌دانند. هدف ما این است که نشان دهیم این رویکرد برای توجیه باور اخلاقی بسنده نیست؛ ازاین‌رو، ابتدا تفسیر توجیه و به‌تعبیر تیمونز، مسئولیت‌پذیری و تعهد را تحلیل و نقد می‌کنیم. سپس مهم‌ترین عنصرهای این رویکرد، یعنی سیاق و باورهای مبنایی زمینه‌ای را نقد می‌کنیم. نتیجۀ پژوهش این است که زمینه‌گرایی ساختاریِ توجیه باور اخلاقی نمی‌تواند موفق باشد و به‌ویژه با اندیشه‌های اخلاقی جوامع دین‌گرا ناسازگار است. It is one of the most important tasks of the contemporary ethical epistemology to answer the skepticism about the justification of ethical belief. Ethical foundationalism and coherentism can be counted among the approaches against ethical skepticism. Mark Timmons introduces contextualism in the structure of the justification of ethical belief as an independent structural theory alongside the ethical foundationalism and coherentism. The aim of this paper is to relate and criticize the features of this approach according to Mark Timmons view. In doing so, we will first explain the features and principles of structural contextualism in the justification of ethical belief. Focusing on context and contextual foundational beliefs, then, we will criticize each one of the features and principles. The result of this study is that the structural contextualism in the justification of ethical belief not only isn’t an appropriate option alongside the foundationalism and coherentism, but it also leads to relativism and skepticism. السیوری الحلی، جمال‌‌الدین مقداد، (1405 ق)، ارشادالطالبین الی نهج‌‌المسترشدین، ج1، تصحیح و تحقیق مهدی رجایی و محمود مرعشی، مکتبه المرعشی النجفی، قم. جوادی آملی، عبدالله، (1375)، فلسفه حقوق بشر، اسراء، قم. ــــــــ ، (1377)، مبادی اخلاق در قرآن، قم، نشر اسراء. حائری یزدی، مهدی، (1361)، کاوش‌‌های عقل عملی مؤسسه مطالعات و تحقیقات فرهنگی، تهران. صدرالمتألهین، (1381)، کسرالاصنام الجاهلیه، تصحیح و تعلیق جهانگیری، بنیاد حکمت صدرا، تهران. ــــــــ ، (1981)، اسفار اربعه، بیروت، دار احیاء تراث‌‌العربی، ج1 تا 9. محمدی منفرد، بهروز، (1392 الف)، «واقع‌گرائی اخلاقی با تأکید بر اندیشه صدرائی»، پژوهشنامه اخلاقی، شماره 19. ــــــــ ، (1392 ب)، «تبیین درون‌‌گرایانه شهودگرایی اخلاقی»، نقد و نظر، شماره 76. Annis, David, (1978), “A Contextualist Theory of Epistemic Justification,” American Philosophical Quarterly, Vol. 15, No.3: pp. 213-219. Bianchi, Claudia and Vassallo, Nicla, ( 2007), " Meaning, Contexts and Justification" In B. Kokinov (ed. ), Modeling and Using Context. Proceeding of the 6th International and Interdisciplinary Conference, Berlin , Springer-Verlag Berlin, Heidelberg: pp. 69—81. Brink, David, ( 1989), Moral Realism and the Foundations of Ethics, Cambridge University Press, New york. Cohen, Stewart. ( 1999), "Contextualism, Skepticism and the Structure of Reason", Philosophical Perspectives, vol. 13, Epistemology: 57-89. DeRose, Keith, (Dec., 1992), "Contextualism and Knowledge Attribution", Philosophy and Phenomenological Research, Vol. 52, No.4: 913-929. ________, ( 1999), “ Contextualism: An Explanation and defense”, The Blackwell Guide to Epistemology, (ed) J. Greco and E. Sosa, Blackwell Malden, MA: 187-205. __________, ( Apr. 2005), "The Ordinary Language Basis for Contextualism and the New Invariantism". Philosophical Quarterly, Vol. 55, No. 219: 172–198. Dretske, Fred I, "Epistemic Operators", The Journal of Philosophy 67, ( 1970),1007–1023. Feldman, Richard, (May. 2004), "Comments on DeRose’s “Single Scoreboard Semantics”, Philosophical Studies, vol. 119 ( 1): 23-33. Foley, Richard. (1993), Working without a Net: A study of Egocentric Epistemology, Oxford University Press, New york. Henderson, David.K. ( Dec. 1994), "Epistemic Competence and Contextualist Epistemology: Why Contextualism Is not Just the Poor Person's Coherentism", The Journal of Philosophy, vol. 91, No. 12: 627-649. Legenhausen, Hajj Muhammad, ( 2015), " Religious Ethics and Moral Realism", Revelatory Ethics, Affiliated to the Ma'arij Research Center for Revelatory Sciences, Qom, Fourth Year, No.9: 13-38. Pritchard, Duncan , ( 2002), "Two Forms of Epistemological Contextualism", in Grazer Philosophische Studien, (ed) by Johannes L. Brandl, Marian David and Leopold Stubenberg, Rodopi , New York: 19-55 ( 37). Sosa, Ernest, ( 2004), “Relevant Alternatives, Contextualism Included,” Philosophical Studies: An International Journal for Philosophy in the Analytic Tradition, Vol. 119, No1/2: 35-65. Stout, Jeffrey, ( 1992), "On Having a Morality in Common." In (ed) G. Outka and J.p Reeder, Prospects for a Common Morality. Princeton University Press, Princeton NJ: 215-232. Timmons, Mark, ( jul. 1993), "Moral Justification in Context." The Monist, Vol. 76, No.3: 360-378. ___________, ( 1999), Morality without Foundations: A Defense of Ethical Contextualism, Oxford University Press, New York. __________, ( 1996), "Outline of Contextualist Moral Epistemology". In (ed). Walter Sinnitt – Armstrong and Mark Timmons, Moral Knowlegde? New Reading in Moral Epistemology, Oxford University Press, New York. Wellman, Carl, ( 1971), Challenge and Response: Justification in Ethics, Southern Illinois University Press, Carbondale and Edwardsville.